NextGen gaming is a game developer with over 20 years experience creating popular online slot games for all around the world. NextGen’s focus is to create a online casino gambling uk games that deliver extraordinary entertainment and quality for their clients. The company attracts players though their unique games, entertain their players through the games they provide and retain their players from the stimulating and fun each game provides so they come back time and time again. This gaming developer lives up to its a name and is powering the future gaming industry. The Irish are famous for good luck so you’re bound to have plenty of it in this scratch card game. 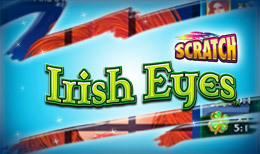 The game takes a stereotypical Irish theme with a rainbow and a leprechaun as the the backdrop with a very cheery and friendly atmosphere. Scratch card games are simple to play as you only need to scratch the surface of the card to reveal what’s behind in a bid to win cash prizes. It’s all about luck. Going along with the Irish theme symbols in the game include a pot of gold, Leprechauns, a rainbow, four-leaved clovers and a lady with red hair. As you’d expect the music of the game is a traditional Irish jingle which is fitting to the theme of the game. The game is made up of a 3 by 3 row set up to the left side of the screen and on the right side of the screen is the paytable which will keep you up to date with bets, winnings and so on. The main aim of the game is to match 3 card and win prizes. The game also comes with an auto play feature which means you once you have selected your bets the game will play automatically without you having to do anything. The auto play function can only be played for a maximum of 25 games. Once you have placed your bets select the play button to place cards and they will begin to drop. Simply swipe the cars to reveal its contents or select the ‘reveal all’ option which reveals the contents of all of your cards at once. Different symbols in the game will offer a different amount of multipliers if you find them on your cards. 3 leprechauns will give you a multiplier of 100x whilst the lady with the red hair will give you a multiplier of 1000x. The other symbols mentioned earlier will give multipliers of anywhere between 0.5 to 100x out. Want to know another fun slot game for you? just click here.